This cowhand perception can be admired on the building north of Delaware Street on 6th. The artist is D.J. Mane, 1993. Another mural by D.J. Mane (1994) is painted on the north side of the Foster Drug Store depicting the old fashioned soda fountain days at Foster's. 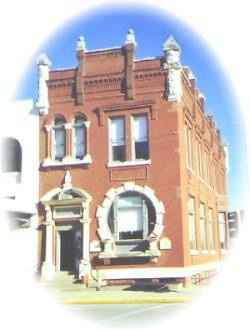 The three story building was built in 1924 to house the various Masonic organizations then active in Perry. In recent years the Masons have moved to a new location but their name remains associated with the building listed on the National Historic Register.